Did you know that Zak’s Furniture started out as a TV and Electronics store? Back in 1959, my father and my Uncle, Marvin Howard, started a joint venture specializing in TV’s and TV repair. This store was named “Bowman- Howard” and was located in the old Peerless Center. During the early 60’s, my father and uncle would dabble into selling other things such as carpet, and eventu?ally some furniture. They quickly developed a passion for the furni?ture retail industry and decided to open a furniture retail store in Boones Creek and relocated Bowman-Howard to Boones Creek in 1968. After tremendous suc?cess from their furniture retail activities, and seeing where the elec?tronics industry was heading, my father and uncle decided to focus strictly on furniture and merged the two stores into one larger furni?ture store. I can’t remember the exact date, but this was around the early 70’s timeframe. So essentially, what started as a 10,000 sq. ft. tv store turned into 160,000 sq. ft. of facilities on 14 acres of land. 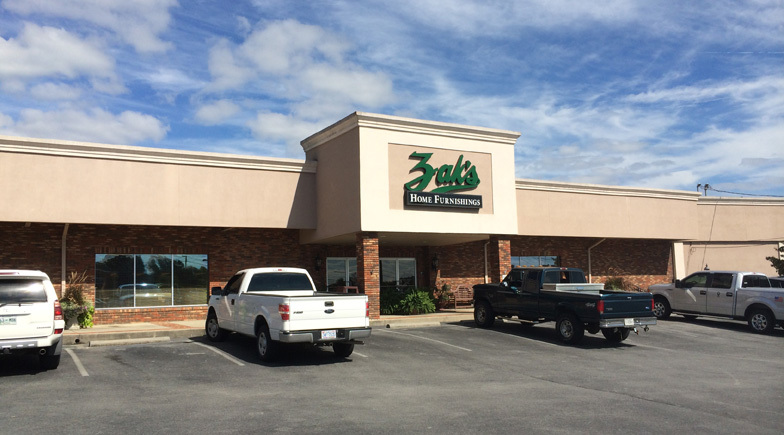 Zak’s is now a regional home furnishings campus serving East Tennessee, Southwest Virginia and Western North Carolina. Zak’s even reaches into Eastern Kentucky and West Virginia as well. Our main showroom covers more than 65,000 sq. ft. of the best looking furniture in East Tennessee. My goal is to simply stock and display quality furniture that I would be proud of owning at the best value found anywhere. Let’s face it, a $399 sofa is not a bargain if it only lasts for a couple of years and starts deteriorating the day it gets in your home. My philosophy, and opinion, is that something like an $899 sofa that will last for twenty years and looks good throughout its lifetime is the better value. In fact, that is my philosophy on everything we carry from sofas, to recliners, to bedrooms, to dining rooms, to accent pieces, to accessories, to end tables and everything else we carry. Everyone’s goal is to have a good looking and comfortable home. The major part of accomplishing this is with good looking and functional furniture. My responsibility at Zak’s is to make good looking and functional furniture affordable for everyone. This is what we do at Zak’s. Zak’s has a 100,000 sq. ft. distribution center on Quality Circle in Boones Creek that warehouses and stocks everything we carry. Let’s face it, the only way to offer the best pricing possible is to buy in large quantities. I also wanted Zak’s customers to be able to get their furniture quickly without having to wait 6-8 weeks for an order to come in. For most items in our showroom, you can pur?chase and pick it up the same day. Also, there have been many changes in the furniture industry in the past 15 years. Unfortunately, most furniture case goods are imported. There are only a handful of furniture case good manufacturers left in the U.S. today and most operate as importers without doing any manufacturing. After getting my feet wet in the retail side of things, I realized that I could essentially do what they do at less expensive pricing. So that is what I did. I now import furniture directly instead of going through a U.S. company to do it for me. The result is lower pricing. Zak’s expanded even further in 2016 by adding a Warehouse Clearance Center adjacent to our main store on Roan Street. Specializing in manufacturer close-outs, discontinued items, scratch and dent items along with special manufacturer deals, I am extremely confident in saying our Clearance Center offers the lowest pricing and best values on furniture and bedding found anywhere in East Tennessee. Almost on a daily basis, there are items we need to move quickly to make room for newer items. And that is what we do. We mark these items down substantially to move them quickly. This “no frills, low pricing” concept has worked out very well for both us and our customers and is yet another option available to our customers when purchasing furniture or bedding. The SleepShop at Zak’s is our bedding division and operates as a store within a store. The SleepShop is probably the one piece of our business that I am the most proud of. We specialize in locally manu?factured bedding by Johnson City Bedding located here in Johnson City. Johnson City Bedding is the Restonic licensee that we use for all of our Restonic bedding. I have found through trial and error over the years that our locally manufactured bedding is the best quality bedding available anywhere and is also the best value for our cus?tomers’ money. We also offer the best values and highest quality mattresses by Kingsdown, Chatham & Wells and SpringAir. The SleepShop at Zak’s has been voted the #1 Mattress Store in Johnson City 12 years in a row. Our service and support regarding not only furniture, but mattresses as well, is second to none and it is always our goal to provide a pleasurable shopping experience before, during and after the sale for our customers. Even though it is probably the biggest piece of the puzzle, furniture is not the only piece involved with making your home comfortable and beautiful. How you arrange your furniture, the colors in the room, the window treatments, the flooring, the blinds and/or shutters, the accessories and accent pieces that go with your furniture reflect your personality and turn your residence into your home. At Zak’s, we help you do this. We offer what is in my opinion the best design service found anywhere in East Tennessee. Our team are not only experts at interior design, but a pleasure to work with. They can create custom window treatments, custom blinds, paint your room, refresh your floors, make your home unique through accessories and accents, etc. You would be very surprised how affordable custom window treatments, wallpaper, painting, flooring and blinds/shutters are at Zak’s. All facets of a room should work together, but sometimes it is overwhelming trying to decide how to do this. We can take all of the stress out of decorating your home and present you with options that you will be happy with for a lifetime. I am very proud of what Zak’s has become and very thankful for what makes Zak’s great, its people. We set very high standards and operate each day with prioritizing our customers’ needs and wants. I have to imagine this is a main reason why we have been chosen as Johnson City’s best furniture store 12 years in a row.